Unrivalled HyperSphere technology places this high-frequency X-ray unit in a class of its own for ergonomics, wireless convenience and image clarity. 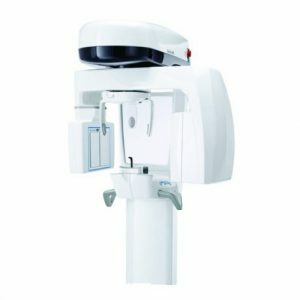 Specifically conceived for digital X-ray imaging, the constant potential tube head combined with the smallest focal spot available for intraoral imaging (0.4 mm) guarantees consistently sharp images and exceptional X-rays. The DCR handheld wireless remote allows the unit to be programmed from anywhere within the operatory. Appropriate selections of kV and mA are automatically determined by tooth selection and patient size. Exposures may be manually increased or decreased as needed. Uninterrupted use during multiple exposures is possible due to a “Dynamic Duty Cycle” that controls tubehead heat making the DC superior in both functionality and safety. Able to revolve freely around the sphere, the lightweight, compact tube head reaches practically any position, including vertical. The full-swivel ball-joint is revolutionary in every sense. 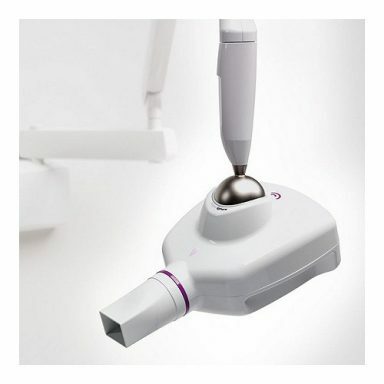 For effortless repositioning of the tube head between exposures the RXDC HyperSphere has an automatic touch-sensitive lock-on/lock-off device. By simply touching the touch-sensitive zones the tube head is unlocked for quick and easy positioning. As soon as you let go, the tube head locks into place with great precision. To acquire excellent images the handheld wireless digital control device can be attached to any available surface in the surgery. 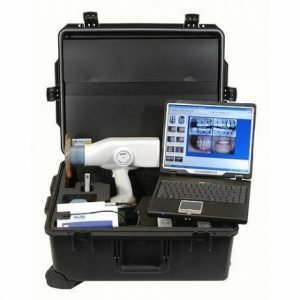 It offers a full range of intuitive exposure scenarios designed to make correct X-ray acquisition a straightforward process. Simply by selecting the region of interest, RXDC HyperSphere automatically defines the correct exposure. There are no other wall-mounted or wired control panels to worry about. The constant potential high frequency X-ray generator together with the embedded 12’’ rectangular collimator increases X-ray parallelism, leading to better image quality and significantly lower X-ray dosage compared to traditional X-ray units. The control unit records the dose to which the patient is exposed in mGy*cm2. The most appropriate combination of technical factors (kV, mA and exposure time) is automatically determined according to patient size and anatomic region of interest.